Shoppers walk in front of shops at Motomachi Itchome in Kobe, Hyogo Prefecture. On the left is the Kobe branch of photo dealer and portrait photographer Torazo Tamemasa (為政虎三, 1871-?). 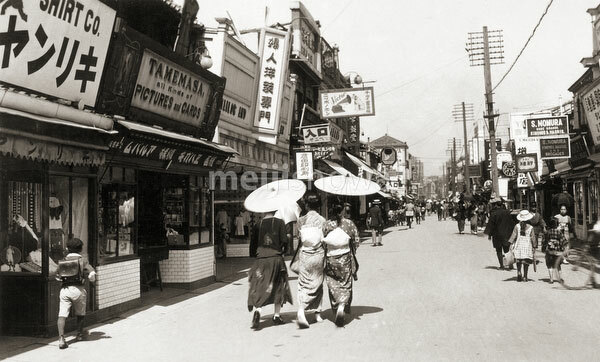 Tamemasa ran a successful business in Nagasaki since the 1890s. The Kobe branch was opened around 1899 (Meiji 32). The three-story building in the background is the famous Western style shirt shop Yamatoya.